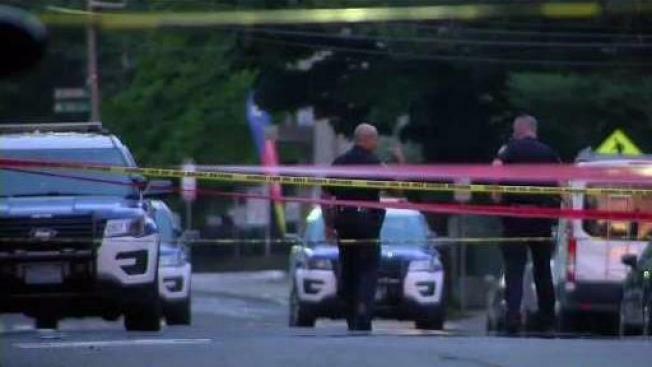 Two people were killed in an overnight shooting in Brighton, Massachusetts, according to a law enforcement source. The shooting happened shortly before 1 a.m. Saturday just outside the Oak Square neighborhood. The area is home to a number of college students and normally quiet. "It’s surprising. It’s a pretty quiet area," John Flagg said. "It’s a lot of college kids, I guess. I didn’t think this could really happen but I guess it can happen in any area." Uniformed officers and detectives worked the crime scene for hours Saturday morning, talking to witnesses and searching for clues. Forensic investigators focused their attention on a Jeep and a pick-up truck parked on opposite sides of the road near the intersection with Dunboy Street. NBC10 Boston saw investigators watching a multi-family home near the intersection of Dunboy and Bracket streets, possibly waiting for a search warrant to go inside. Witnesses in the neighborhood told NBC10 Boston they heard gunfire just before 1 a.m. and saw bodies lying in the road. "We were just about to go to bed and we heard four kind of loud noises I guess, and I thought they were fireworks. They weren't," Cassidy Bayen said. "I saw the flashing lights, came outside, and you could see a barricade up around a couple bodies," Jake Bailly said. The two victims have not been identified, and officials have not revealed a possible motive. Boston police are actively investigating. Faneuil Street has reopened after being shut down for several blocks but police were still on scene as of noon.